CAYCE, S.C. -- At least two people were killed and 116 others injured when a train traveling from New York to Miami struck a freight train Sunday morning, authorities said. The crash left thousands of gallons of oil spilled at the scene near Columbia, South Carolina. The collision occurred in Cayce around 2:45 a.m. Sunday, Lexington County spokesperson Harrison Cahill said. He said the passenger injuries ranged from scratches to broken bones. The two victims were later identified as Amtrak personnel. Lexington County Coroner Margaret Fisher said 54-year-old engineer Michael Kempf and 32-year-old conductor Michael Sella were killed in the collision. "Any time you have anything that happens like that, you expect more fatalities," Fisher said, "but God blessed us, and we only had the two." There were approximately 148 people aboard the Amtrak Train 91, including 139 passengers and eight crew members. The train was going an estimated 59 mph when it struck the empty CSX train around 2:45 a.m., Gov. Henry McMaster said. The crash happened near a switchyard where railcars hauling automobiles are loaded and unloaded. Robert Sumwalt, chairman of the National Transportation Safety Board (NTSB), said investigators found a switch had been set in a position that forced the Amtrak train off the main track and onto the siding. He said the question for investigators is why that happened. Amtrak President Richard Anderson appeared to point the finger at CSX, saying the signal system run by the freight railroad at that spot was down at the time, and CSX dispatchers were manually routing trains. The NTSB said it was working to confirm that. 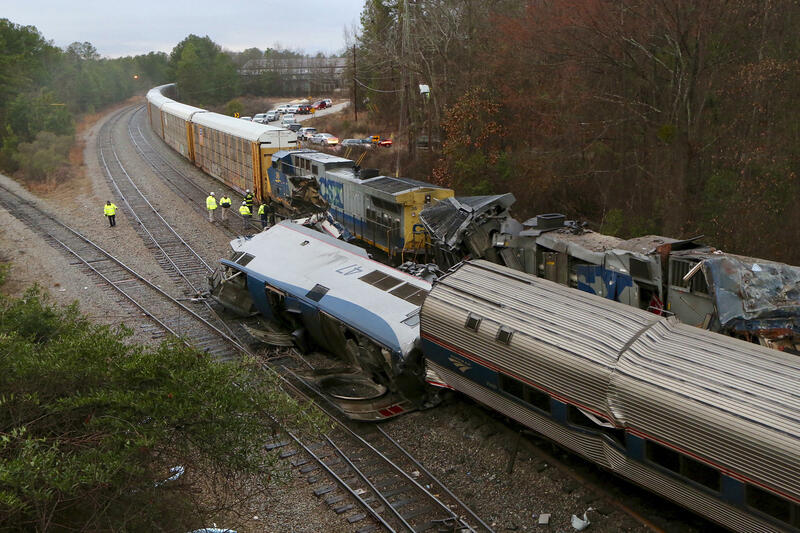 CSX issued a statement expressing condolences but said nothing about the cause of the accident. Sumwalt said that positive train control -- a GPS-based safety system that can automatically slow or stop trains -- could have prevented the accident. "That's what it's designed to do," he said, referring to technology that regulators have been pressing for for decades with mixed success. Investigators recovered a camera from the front of the Amtrak train and were looking for the data recorders from the two trains. The switch that triggered the crash was padlocked in position, which conductors are supposed to do when they move a train from one line to another, Sumwalt said. Authorities said the freight train spilled 5,000 gallons of fuel, but hazmat teams were dispatched to the scene and determined the leak was not a danger to the public. Amtrak said the lead engine and a few passenger cars derailed. The crash happened near a stretch of tracks by a rail yard about 10 miles south of Columbia, where several track spurs split off for freight cars to be unloaded. Passenger Derek Pettaway told CBS News that he was sleeping when the train began "shaking violently" before coming to a sudden halt. "You knew we'd hit something or we'd derailed," Pettaway said over the phone. "The Amtrak crew was really great. They responded quickly and got everyone off the train." Elliot Smith told Columbia newspaper The State he was at a friend's house when they heard what sounded like a propane tank exploding. Smith and his friend walked to the crash site and saw passengers of all ages beginning to exit the train. "The sound was so loud, you instantly knew it was bad," Smith said. "More people were shocked than shaken from the crash," Pettaway said from the local Red Cross shelter where other train passengers were being transported. President Trump has been briefed on the crash and is receiving regular updates, Deputy Press Secretary Lindsay Walters said Sunday morning. Mr. Trump, who is currently at his golf club in West Palm Beach, Florida, tweeted his condolences to the victims. "My thoughts and prayers are with all of the victims involved in this mornings train collision in South Carolina," he tweeted. "Thank you to our incredible First Responders for the work they've done!" The crash comes several days after an Amtrak train carrying Republican members of Congress hit a garbage truck in Virginia. One of the truck's passengers was killed in the collision. After the latest crash, Sen. Richard Blumenthal, D- Conn., said the nation's railroads must be made safer, declaring, "Business as usual must end." He said proven technology, including positive train control, cannot continue to be delayed. The latest wreck again raised criticism about the safety culture of the nation's passenger railway. With the string of crashes, "it's becoming almost like an epidemic for Amtrak," said Najmedin Meshkati, a University of Southern California engineering professor who has studied positive train control. The worst rail tragedy in recent South Carolina history took place in 2005 when a freight engineer parked a train on a side track near a textile mill in Graniteville and forgot to flip the switch back to keep trains on the main track. A freight train passing through went barreling down the side track and slammed into the parked train, killing nine people, most of them millworkers choked by chorine gas that leaked from a damaged tanker car.